So. Now that I’ve exposed my most Darwin-award-worthy moments (or at least a teeny tiny fraction of them), I’m hoping that the next laughable thing on my list will seem a little less laughable. 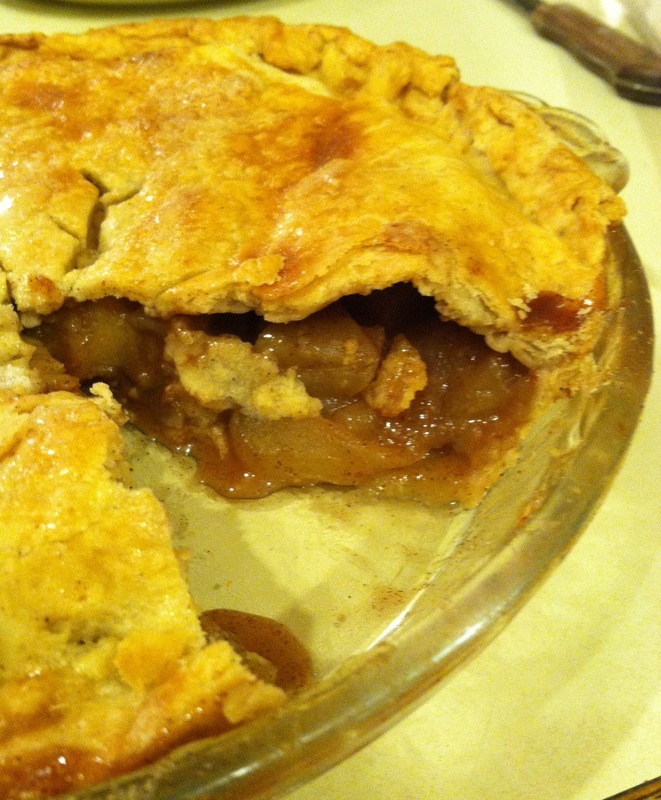 I’m talking about these pie pictures, of course. The pictures that I took on my iPhone at 8pm in the yellowy artificial light of my kitchen with my dad standing two feet away practically salivating as he waited for his slice. Unfortunately my brother won’t be home for the holidays until tomorrow; otherwise I would have clearly taken advantage of his photography skills. Which are about 10,000 lightyears above mine. Thus, instead of making you all wait even longer for my next post (I know it’s been over two weeks and I’m sorry!) I decided to have a long, hard laugh and offer you these fantastically grotesque pictures along with a pretty stellar recipe. Use your imaginations! The truth is, this is a pretty darn delicious apple pie. I love how the crust is spiked with a hint of cinnamon and nutmeg, and the filling is a perfect balance of sweet, tart, and spiced. 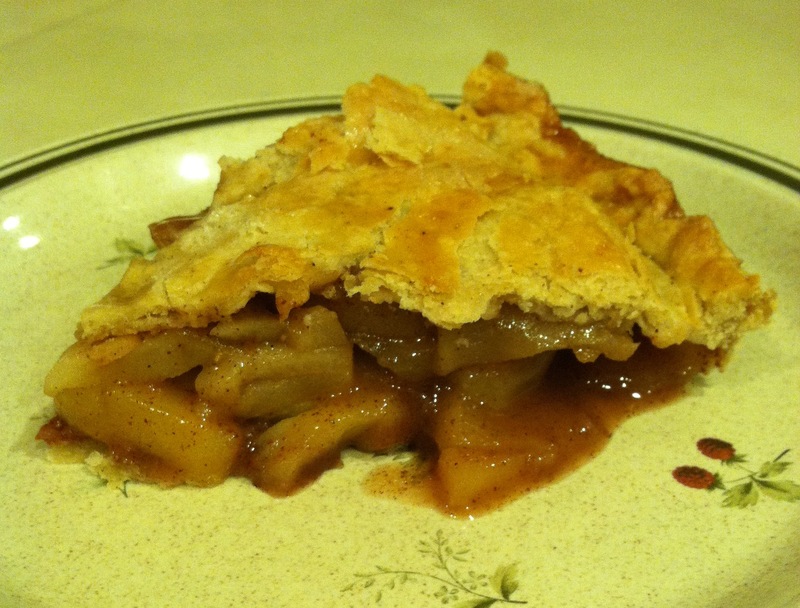 I used a combination of Granny Smith and Honeycrisp apples, which I would highly recommend. The filling itself is quite simple–just toss together some standard ingredients and fold in the apple slices. Pour it all into your pie crust (which, I’ll admit, is the harder part that I have yet to perfect) and bake until golden and bubbly! You’ll end up with a house that smells so good you’ll want to bottle it up and put it into a candle. 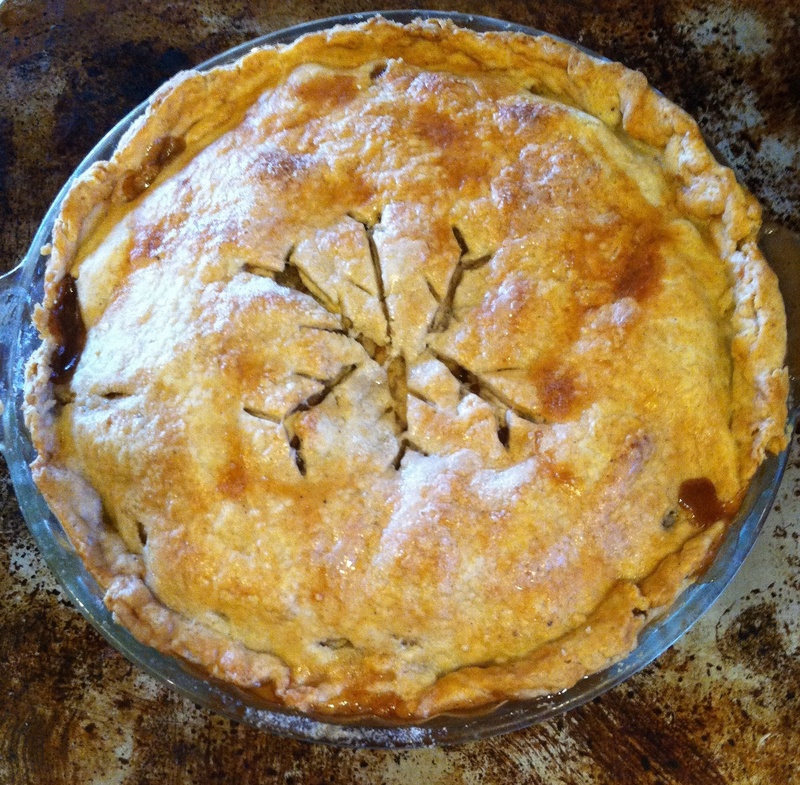 And of course you’ll get a delicious apple pie, too. Horrid pictures aside, this recipe is a keeper! For the crust, whisk together the flour, sugar, salt, cinnamon, and nutmeg in a large bowl. Using a pastry blender or two forks, cut in the cold butter and shortening until the mixture is coarse and crumbly. Add in the water one tablespoon at a time, tossing with a fork, until the dough holds together. Form the dough into two equal balls, wrap in plastic wrap, and refrigerate for at least 30 minutes. 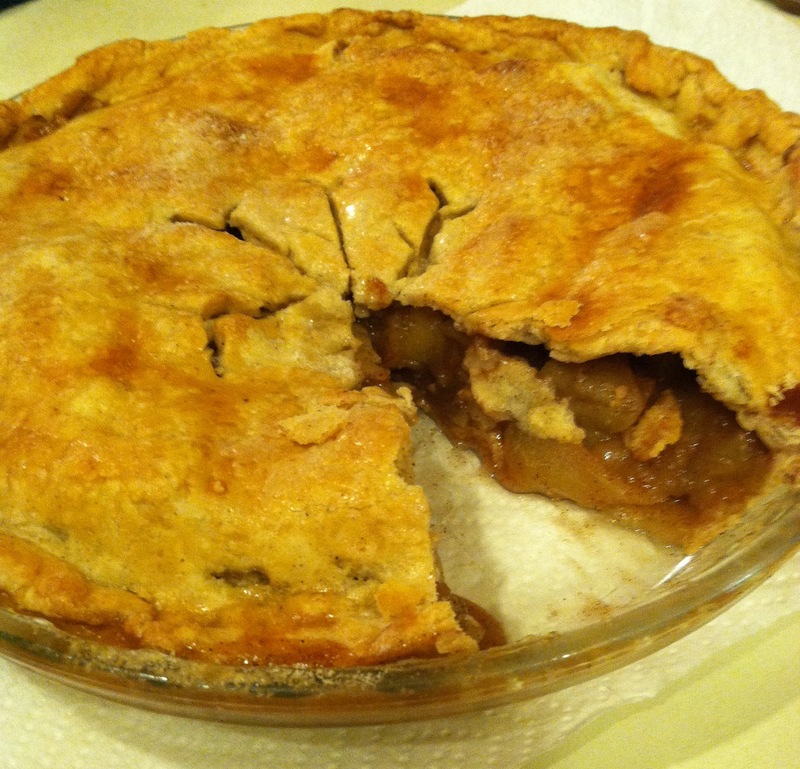 Preheat the oven to 400 degrees F. For the filling, combine all the ingredients except for the apples in a large bowl. Fold in the apples until they are coated in the mixture. Roll out the dough into two 12-inch circles. Carefully transfer one of the crusts to a 9-inch pie pan. Press the crust into the bottom and sides of the pan, leaving a 1/2-inch overhang along the sides. Pour in the apple filling and top with the remaining crust. Crimp the edges. Cut several slits into the top crust. Brush the beaten egg onto the top and edges of the crust. Sprinkle the crust with granulated sugar. Cover the edges loosely with strips of aluminum foil and bake for 35 minutes. Remove the foil and bake for an additional 10-20 minutes or until crust is golden-brown and filling is bubbly. Let the pie cool for at least 30 minutes before slicing. Store leftovers in the refrigerator. Secret ingredients are my favorites. I love being on either end of the guessing game: the eater or the maker. I know that many people run away screaming when they’re approached with a mystery food and the claim that they’ll “never ever guess what’s in it,” but I’m certainly not one of them. I love finding out that the seemingly innocent chocolate pudding given to me with a sly grin was made out of avocado, cocoa powder, and coconut sugar; on the flip side I find it largely entertaining to watch my family try to guess what gives my black bean chili a certain depth of flavor, never suspecting that the answer is a trio of pumpkin, cinnamon, and cocoa powder. Whether it’s a dash of cinnamon in a homemade cherry pie or a can of black beans in a batch of flour-less brownies, I’m always excited to try out a recipe made with something you’d never expect. 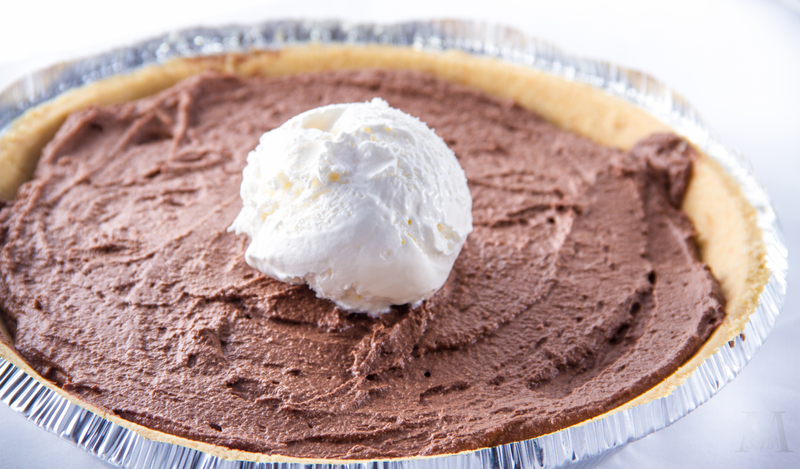 This Silken Chocolate Fudge Pie can easily fool you into thinking it’s sinful. 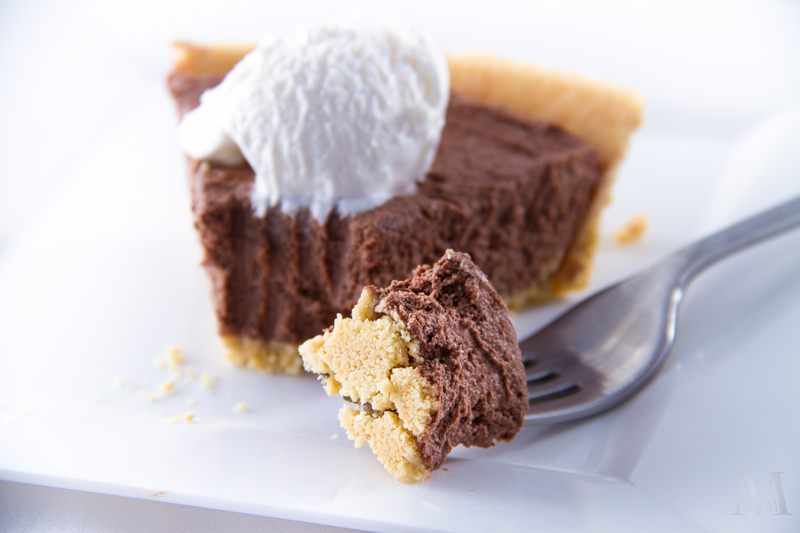 Its smooth, rich chocolatey filling tastes just like (a really good) chocolate cream pie, and it manages to be firm yet airy at the same time. I’m pretty confident that I could have eaten the entire pie if I let myself, especially when topped with a dollop of whipped cream! The best part is that even though this pie may look and taste like a dessert packed with sugar, cream, and butter, it’s surprisingly healthy! 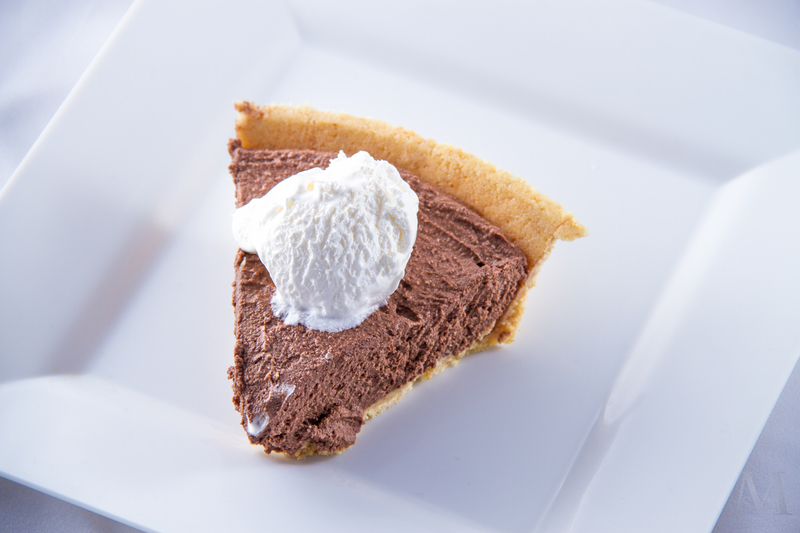 Made with a short list of ingredients that are simply thrown into a food processor and blended, this pie is incredibly quick and easy. It doesn’t even need to bake! There’s no gluten or dairy involved, and in this case the sneaky little wonder ingredient is…tofu! Stick with me here. I know lots of people turn up their noses at tofu, hating on its bland mild taste and unappealing acquired texture, but in this pie it is virtually undetectable. 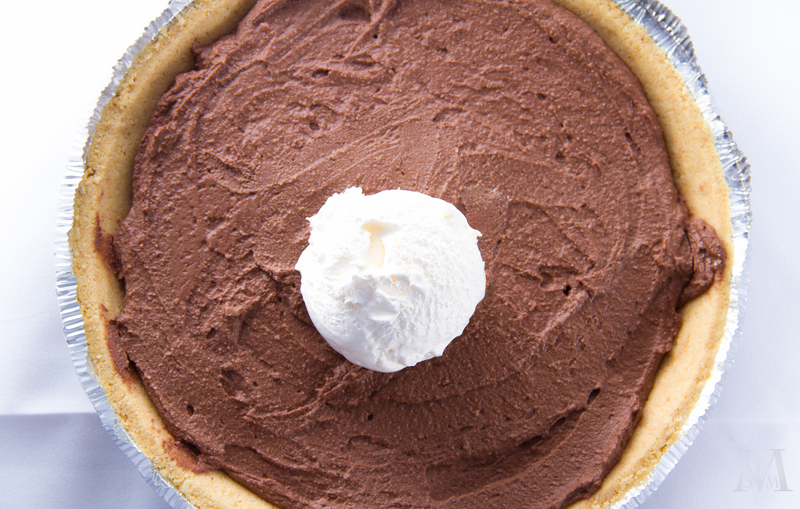 It manages to give the pie its firmness without adding any funky aftertastes so that all you end up tasting is rich, delicious chocolate. The rest of the ingredients aren’t scary at all: milk, cocoa powder, vanilla, salt, and melted chocolate. I was feeling rebellious and decided to ruin the healthiness of it all by pouring the filling into a store-bought shortbread crust (and possibly going so far as to top it with Cool Whip), but you could definitely make your own pie crust or just pour it into little ramekins and serve as a custard-y dessert. Firm tofu will create a more traditional pie that holds together well, but if you want a more mousse-like pie or a crustless pudding, just use soft tofu. Ten points to tofu for its versatility….yet another reason it’s such a star in this recipe! 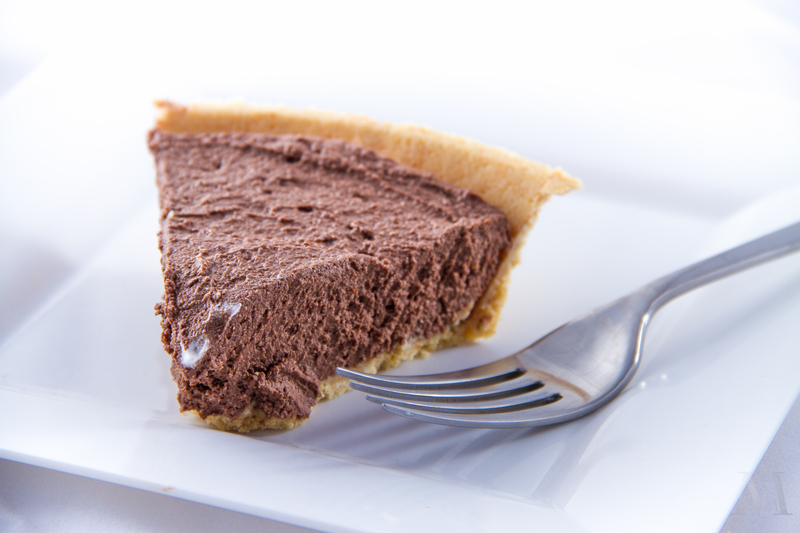 So, the next time you catch yourself with a chocolate craving, go the healthy route and whip up this chocolate pie! It’s guaranteed to satisfy your sweet tooth without the extra baggage of junky ingredients, and it’s also fun to serve to unsuspecting friends. I bet they’ll never guess it’s made with tofu…I know I wouldn’t have! Melt the chocolate chips in the microwave or in a double boiler, stirring until smooth. Place all the other ingredients into a food processor or high-powered blender and scrape in the melted chocolate. Blend or process until very smooth. Mixture will be thick. Pour the filling into the prepared crust and refrigerate for at least 2 hours. The longer it chills, the firmer it will be (I chilled mine overnight). 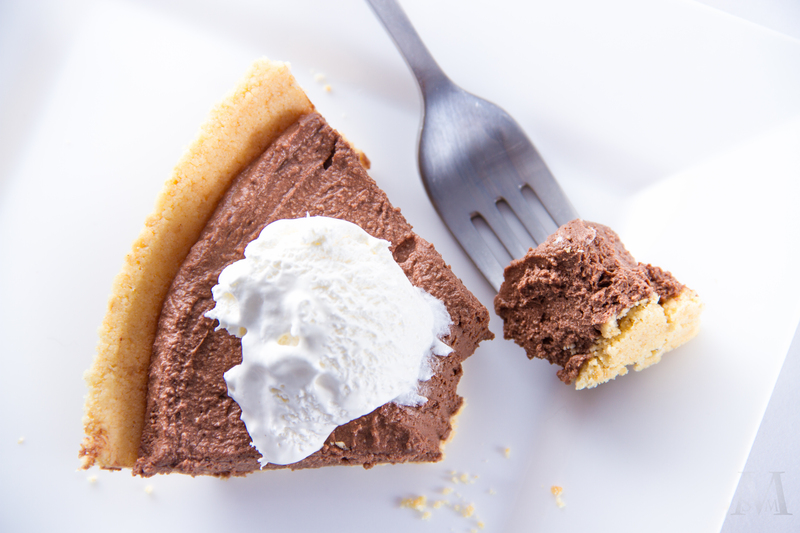 Slice and serve, topped with whipped cream if desired.